Absolute Power seems to blend in with a group of Clint Eastwood thrillers that were released from about 1997 to 2002. I almost miss him taking on projects like those because now it seems like everything he does is a biopic now. Eastwood has only appeared in 5 films since 2000 and his last was Trouble with the Curve 6 years ago. It is one of several thrillers that Eastwood directed himself in. At this time the posters for these films seemed to have nothing but Eastwood's face on them True Crime and Blood Work would be two films you could mistake for this one just because of the poster. I went with Absolute Power because it had the best cast of the crowd. In a return to a criminal type role Eastwood plays Luther Whitney, a veteran thief who witnesses a murder that involves the President of the United States when he and a lover enter a home he is burglarizing. He is able to escape the house grabbing a forgotten murder weapon while the secret service attempts to pin the murder on someone else. The cops become suspicious of Luther thinking that whoever robbed the house must have killed the woman as well. The opening sequence in the film is a long one. It really sets the framework for the rest of the movie and it appears to take place in real time. After a while I felt a little bored of it. It easy runs about 15 minutes too long. A movie involving a corrupt President is almost certainly going to attract eyes. It really is an interesting concept. The fact that the President is also played by Gene Hackman makes things even more intriguing. There is hardly anyone in the film who isn't a recognizable face. There are two Oscar winners in Eastwood and Hackman and four nominees (Ed Harris, Laura Linney, Judy Davis and Richard Jenkins). I felt like this could've been a top tier thriller I ended up only mildly enjoying it. Mostly because I felt like the film was lacking character. The only real interesting relationship in the movie is Eastwood's relationship with his daughter played by Laura Linney. The whole estranged daughter angle feels like its a bit of a Clint cliché at this point. I'm sure there are few films where he actually plays a good husband and father. Whitney Luther has spent some time in jail in the past and his relationship with his daughter suffers because of it. Its disappointing, as someone who basically approached this movie for its cast, to see that a lot of the key players don't share the screen often. Gene Hackman, who has already worked with Eastwood in Unforgiven doesn't say a word to him in this whole movie. 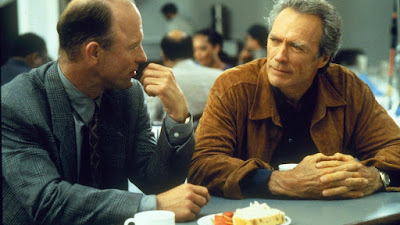 Ed Harris shares a few cool moments with Eastwood, but not enough. When all is said and done Absolute Power is an ideal cable watch. For me is was just good enough to be worth the rental on iTunes. There are dozens of Eastwood projects that are better than this one, but if you're a completest Eastwood fan this one shouldn't hurt too much.